The Vietnamese Calendar is a Lunar Calendar that is mostly based on the Chinese Calendar. The Lunar Calendar has a fix number of twelve months with 30 days each, and a leap-year will have a whole intercalary month instead of the 29th day of February. The new year of Lunar Calendar normally will start in late January or beginning of February according to Gregorian Calendar. That explains why Tet days vary from year to year: it is because the leap month may fall shorter or longer which create a smaller or bigger gap between the two Calendars. The Vietnamese administrative offices officially started to use the Gregorian Calendar in 1954, while the civilian populace continued to use a variety of local Calendars derived from French, Chinese and Japanese sources. The North Vietnamese government issued a decree in 1967 to make the Gregorian Calendar the sole official Calendar, restricting Lunar Calendar use to holidays and commemorations. South Vietnam would later join this change at the end of the Vietnam War in 1975. 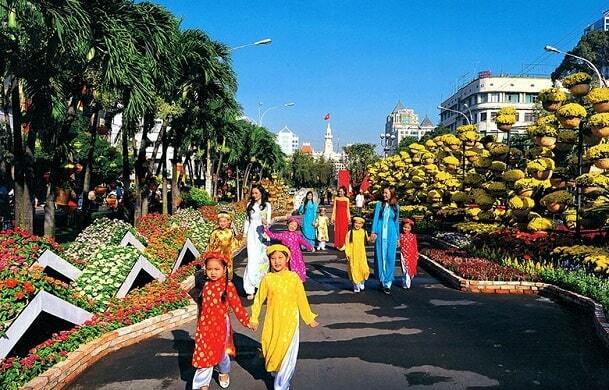 Tet Nguyen Dan, or Tet for short, is considered the biggest and most popular festival of the year in Vietnam. Celebrated on the first day of the first month in Lunar Calendar, Tet�s celebration is the longest holiday. Tet Nguyen Dan -festival or Vietnamese New Year (it is at the same time as Chinese New Year). In the Vietnamese zodiac, the cat replaces the Rabbit in the Chinese zodiac. So, a child born in the Chinese year of the Rabbit will be born in the Vietnamese year of the Cat. The Vietnamese zodiac uses the same animals as the Chinese zodiac for the remaining 11 years, though the Ox of the Chinese zodiac is usually considered to be a water buffalo in the Vietnamese zodiac. The Vietnamese will start their their celebration with preparing everything well in advance of the upcoming New Year. In an effort to get rid of the bad luck of the old year, people will spend a few days cleaning their homes, polishing every utensil, or even repaint and decorate the house with kumquat tree, branches of peach blossom, and many other colourful flowers. The ancestral altar is especially taken care of, with careful decoration of five kinds of fruits and votive papers, along with many religious rituals. Everybody, especially children, buy new clothes and shoes to wear on the first days of New Year. People also try to pay all their pending debts and resolve all the arguments among colleagues, friends or members of family. 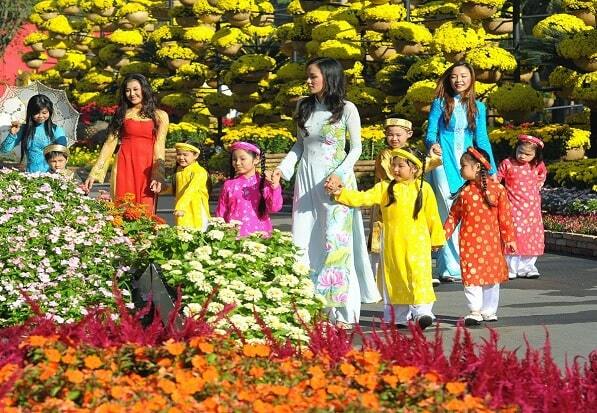 Festivities are organized such as parades, dragon dances, fireworks and flower parades, but mainly it is a family celebration. The Vietnamese people travel throughout the country to visit their families and eat special meals. The new beginning of the year also includes new clothes, homes are thoroughly cleaned and they refurbish the graves of the ancestors. Most shops and many restaurants are closed during Tet. The festival is celebrated everywhere, but there are also crowded and lively markets in the villages. Everywhere is a special flower markets. The whole family will eat together and the house is nicely made and clean. Everyone says to each other a good wish. Sacrifices to the ancestors are made at an altar. Children receive gifts and new clothes. And do not forget 'lucky money'. Fortunately money is given in a beautifully decorated red bag. The children say a desire against their parents and then get the bag. Much food is prepared. Very tasty food. On New Year Day the family usually goes to a pagoda. A kind of temple where they ask various gods for happiness for the new year. They also burn much incense. Then they eat in Vietnam a rice cake (Banh Chung). These are cakes of sticky rice stuffed with pork, fat, beans and onions and is the first dish served during the extensive lunch of seven different dishes. The drinks are mainly beer and water.